In a stirring and evocative Nobel Peace Prize speech in Oslo, Norway, on Saturday (Dec. 10), Colombian president Juan Manuel Santos mentioned scholars, poets, negotiators, researchers, NGOs, activists and other Nobel Laureates who contributed — by inspiration or dedicated action — to the end of the western hemisphere’s oldest and largest armed conflict. 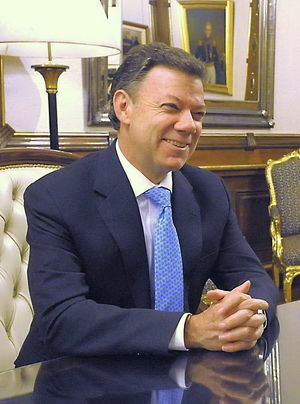 Santos directly acknowledged the University of Notre Dame’s Kroc Institute for International Peace Studies, which has served as an academic partner in the Colombian peace process for many years and is now engaged with the commission charged with implementing the peace agreement in Colombia through the Peace Accords Matrix (PAM) project. “The Kroc Institute for International Peace Studies at the University of Notre Dame in the United States has concluded, based on careful studies of the 34 agreements signed in the world to end armed conflicts in the past three decades, that this peace agreement in Colombia is the most complete and comprehensive ever reached,” Santos said in his speech. “It was a strong and emotional speech, and very rewarding to see its mentioning of the Kroc Institute,” said Peter Wallensteen, a prominent international peace researcher from Sweden’s Uppsala University and the Richard G. Starmann Sr. Research Professor of Peace Studies at Notre Dame, who has been involved with PAM since its inception. The Kroc Institute has been involved in the Colombian peace process for many years, in particular through its Peace Accords Matrix and its team of researchers and analysts. The PAM project measures the progress of peace agreements on a systematic comparative basis. Its database tracks the implementation status of 34 recent comprehensive peace accords by assessing 51 distinct provisions year-by-year for 10 years in quantitative and qualitative form. The PAM project, formerly directed by John Paul Lederach, professor of international peacebuilding, and currently directed by David Cortright and Madhav Joshi and advised by Wallensteen, includes research faculty member Jason Quinn, PAM Latin America representative Francisco Diez, and research staff and graduate students in peace studies. As was announced last August, PAM will be formally involved in the ongoing technical verification and monitoring of implementation of the Colombian accord. The Kroc Institute for International Peace Studies is an integral part of Notre Dame’s new Keough School of Global Affairs, now offering a Master of Global Affairs degree with concentrations in global affairs, international peacebuilding and sustainable development. Originally published by Joan Fallon at news.nd.edu on December 12, 2016.